If you’re looking for somewhere to host your next corporate function, Sydney has a number of impressive venues suitable for events of all sizes. Whether it’s a conference, small staff training session, breakfast, or cocktail party, you’ll be able to find the perfect venue to suit your needs. Below are our top picks for the best corporate function venues across Sydney. The ICC is one of the most versatile function centres in Sydney, with a number of different sized spaces. 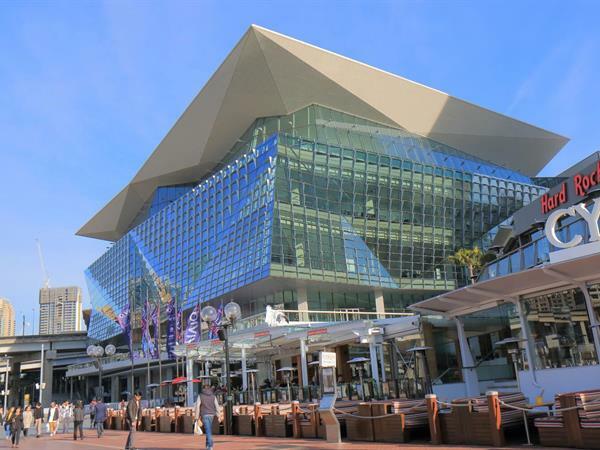 Located among restaurants and retailers in a waterfront precinct on Darling Harbour, the ICC is a world class venue. The location is also ideal for business functions, being only a short walk from the CBD, and operates two 24 hour car parking lots with 826 car spots. For banquets, cocktail parties and gala dinners there are several large ballrooms to choose from, with flexible rigging and staging, as well as magnificent harbour views. The Parkside Ballroom has a 1,400 theatre capacity and 740 seating capacity, with internal access to all facilities within the ICC. The Grand Ballroom has a 2,000 seat capacity and 3,500 if used as a cocktail venue. It’s the largest ballroom in Australia, featuring spectacular 9m high ceilings. For conventions and conferences, the ICC has multiple set up styles that can be tailored specifically to your event. The high ceilings allow for natural lighting and skyline views of the city, making it an impressive venue for all who attend. The ICC also features speaker preparation rooms with computers, workstations, microphones and lecterns to make conference preparation a breeze. Finally, the ICC is a great venue for smaller meetings and seminars too. Meeting rooms include fixed audio and ceiling sound systems, fixed screens and projectors, as well as coffee machines. The ICC also has an extensive menu suitable for all types of events including breakfast, lunch, dinner, morning and afternoon tea, as well as cocktail menus. Another stunning venue is the SMC Conference & Function Centre. It features 16 event spaces so is another flexible option for hosting any sized event. SMC is also equipped with state-of-the-art high speed internet and superior in-house audio visual options, making it perfect for meetings, training sessions and conferences. The Rawson Meeting Room is mainly used for intimate boardroom meetings with an additional breakout space for larger conferences. It has a capacity of 40 people and includes access to complimentary tea and coffee. For larger events, the Ionic Meeting Room is the largest of the 16 spaces, opening into the main foyer area. It has can hold up to 280 people theatre style or 150 with a classroom configuration. Menus can be tailored to suit any event including meeting packages, private dining, platters, cocktail menus and buffets. It’s also another easily accessible venue, conveniently located just a 5 minute walk from Museum Station, with secure parking nearby at the World Square Carpark. For something a little different, Centennial Parklands offers a range of indoor and outdoor venue options, with onsite parking available. For outdoor events, The Parade Grounds is a large, flat, turfed area with a pine forest backdrop. It is best suited for large events of 5,000 people or more. Other large scale outdoor event options including the Brazilian and Mission Fields. For indoor events in the area, Moore Park Golf House is a beautiful heritage-listed building located within the grounds of the golf course. Doltone House has a long history of hosting magnificent corporate events, with several venue options across Sydney. The Hyde Park location can seat up to 500 guests in the main ballroom, otherwise you can choose the from sleek Manhattan and Avenue rooms for smaller meetings. The Darling Island venue boasts an idyllic view of the Harbour Bridge and city skyline in its waterfront location. The main event space has a capacity of 800 seated guests with additional breakout room available. It also has a number of contemporary meeting rooms. Doltone House Jones Bay Wharf is a stunning heritage building in Pyrmont. The decking area offers views of Darling Harbour and allows for seating of up to 700 guests. Finally, the Australian Technology Park location offers an industrial-style venue a bit further out of the CBD. It has a delicious 5 star menu, theatre space, main event area and several meeting rooms. All Doltone House function centres also offer a conference package which includes tea and coffee, morning tea, working style lunch, afternoon tea, pens and notepads. Another option outside of the CBD is Watsons Bay Boutique Hotel. For a relaxed, beachy feel, the Hotel can hold any event from intimate 40 people meetings, to lavish parties for 2,000 guests. The Beach Club on the garden terrace can hold up to 400 people and offers picturesque waterfront views, with the Harbour Bridge in the distance. The Top Deck can be hired for cocktail style parties and canapes and has a retractable roof for shelter if the weather turns. It can seat up to 120, or 200 for stand up events. For classy indoor conferences, the Sunset Room has a Hamptons inspired interior and private bar for up to 250 people.There are a few transport options to Watsons, including ferry, private boat or water taxis to take your guests from the city. Alternatively, private buses and taxis can be arranged. Whatever the size and purpose of your upcoming corporate event, there are so many options right across Sydney to choose from. With many venues offering flexible room layouts and menus, you’ll be able to find the perfect space. And if you’re looking for somewhere for your guests to stay the night, The York by Swiss-Belhotel is conveniently located in the heart of the CBD on York Street and offers 120 suites, from Studio Apartments, to three bedroom Executive Apartments.